Dermatology and Genitourinary Medicine Journal Club Group on the WhatsApp has been created. If interested to join us, please WhatsApp me. The RCPSG (a charity) was established by Royal Charter from King James VI of Scotland (James I of England) in 1599. *The first and fourth quarters of the shield contain the lancet that represents the surgeons, and poppy that represents the laudanum used by the physicians and the snake-entwined staff that represents Aesculapius, Greek god of medicine. *The second quarter of the shield contains the Royal Arms of Scotland (the lion of Scotland) and reflects the gift of the original charter from King James VI of Scotland (James I of England). 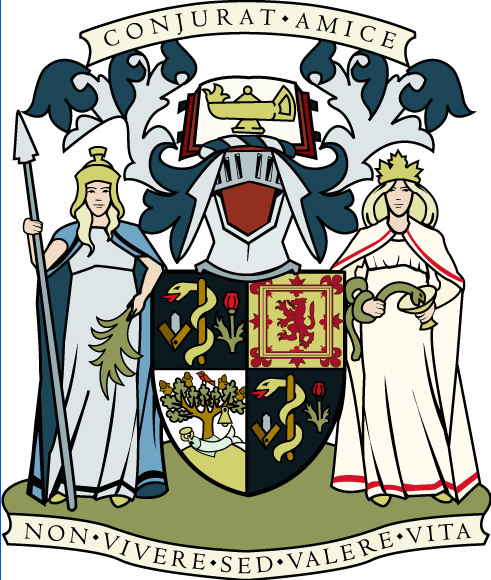 *The third quarter has the familiar arms of the City of Glasgow, reflecting the College's origins in Glasgow and the West of Scotland. There are the tree that never grew, the bird that never flew, the bell that never rang and the fish that never swam. *The supporters are Hygeia (goddess of health) on the right, and on the left, Minerva (goddess of art and science). *The crest is an antique lamp on an open book, which symbolises the light of learning dispelling the darkness of ignorance. *The coat of arms has two mottoes. Above is "Conjurat Amice", translated as "We live together in amity". This reflects the unique nature of the RCPSG in encompassing physicians and surgeons, whereas those of Edinburgh and London are separate. The motto below the shield reads "Non vivere sed valere vita". It is an epigram of the Roman poet Martial and can be translated into English as "Not simply to live but to enjoy life". From putting knowledge before wisdom, Almighty God, deliver us. Sir Robert Hutchison. Sir Robert was a Scottish physician and a former President of the Royal College of Physicians of London. ©2010 - 2018 by Amr Gohar. Awesome Inc. theme. Powered by Blogger. All rights reserved. No part of this publication may be reproduced, stored in a retrieval system, or transmitted in any form, or by any means, electronic, mechanical, photocopying, recording or otherwise without the prior written permission of the copyright owner. You may, however, use the work for your own noncommercial and personal use; any other use of the work is strictly prohibited. I cannot be held responsible for any consequences arising from the use of information contained in this publication. It is the ultimate responsibility of the medical practitioner to determine the best treatment for each patient.